The word “Behbud” translates as “advancement”. Behbud is a nonprofit organisation working for women empowerment on a number of fronts, and they began their efforts as the rehabilitation of the 1965 war victims in conjunction with a small industrial home and dispensary. Behbud is a pioneer amongst Pakistani nonprofits, and has almost 50 years of experience in poverty alleviation efforts. The organisation has an ecosystem in which the poor have the chance to seize control of their own lives through a holistic development approach using education, healthcare, legal advocacy, community empowerment and social enterprises for women’s economic self-sufficiency. 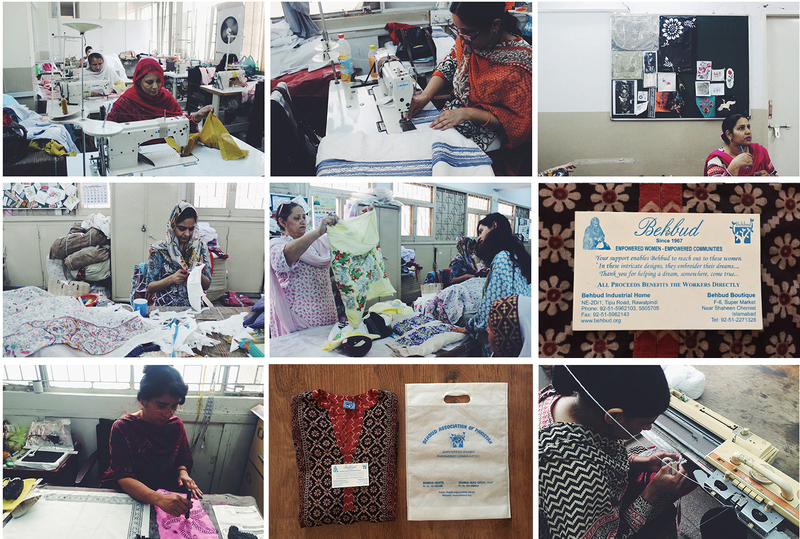 The industrial vocational centre in Rawalpindi provides opportunities to the thousands of women workers who train at the facility. Women learn craft, sewing and vocational skills at the skill centres, and Behbud has trained over 100,000 home-based workers spanning 4 generations.The Behbud Boutique is the only channel where the women are able to sell the crafts they produce both as home-based workers and at the industrial home. Visiting the industrial home is a personal pleasure- the sunny disposition of the women and the beautiful crafts they produce are always a joy to behold. When my friend (and trusty Digital Strategist) and I were given a tour of the facilities, we immediately felt that the current branding and communication did not do justice to Behbud’s story. Not only are the products beautiful, but they also preserve and innovate on traditional Pakistani crafts like Kaanta, Ralli, Cross stitch, Block printing and Shadow-work. Talking to the women and hearing about their stories of economic independence was inspiring. We needed to communicate this message, and also bring Behbud up to speed with how brands today operate. An e-commerce solution would allow Behbud to access new markets, increase their sales and showcase the stories of their artisans alongside. While trying to understand the brand, we realised that Behbud was unlike most NGOs- in fact, they shy away from the term. Behbud, instead stood for an aspirational ideal with a distinctly sophisticated Pakistani identity. In rebranding the boutique then- the challenge is to capture the brand values of being exquisite, traditional and handcrafted. Currently, I’m working on the branding collateral and website while my partner handles the logistical issues of converting from a brick-and-mortar store to an online one. As part of the promotional strategy, a social media presence is also to be launched soon.